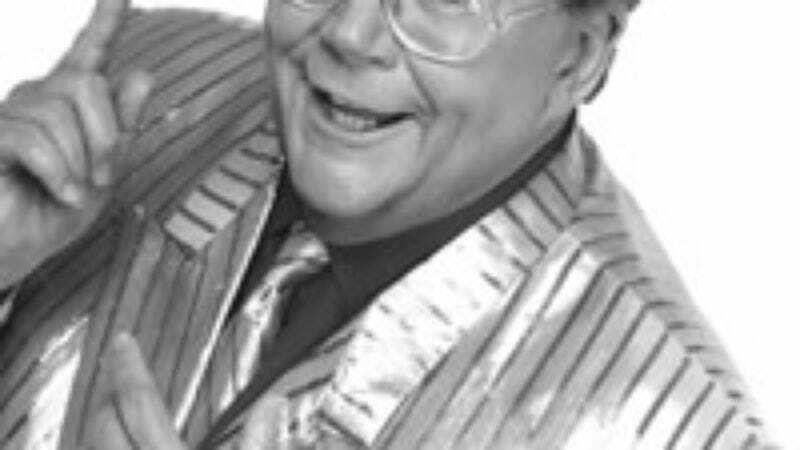 Even if you don't immediately recognize his name or his face–though you certainly should–you know the voice: As The Price Is Right's gregarious, flashy-dressing announcer, Rod Roddy has spent the last 11 years giving away millions of dollars in prizes and shouting time-honored phrases like, "A new car!" and "Come on down!" The Onion recently spoke to Roddy about the many facets of his enviable existence. The Onion: Let's start with your job. O: You get a lot of people, especially the college students, who get up there and are, like, "I've been watching you since I was three years old!" RR: That's right. People grow up watching this show. O: Does it make you guys feel old? RR: Well, every once in a while, I'll look at Bob, and I think, "Gee, I'm old." [Laughs.] No, that's not true. It doesn't make you feel old. It's just an amazing connection with the public. It's just remarkable, because it is a piece of Americana. I've done a lot of television shows, but nothing like this. It's a part of the American fabric. O: And it's never really changed. RR: No, and that's the secret to it. It doesn't change, but yet it does. The reason it's successful, in my opinion, is that we have so many games. There are, like, 63 games, and they keep adding games all the time and changing them. The games change every day, and the people change every day. Most of the game shows that I've done are just the same games. I did Press Your Luck for many years—you know, "No Whammys, Big Bucks." O: I loved that show. I was upset when that went off the air. RR: So were we. [Laughs.] It's still running in England now. But the truth of the matter is that the game never changed. All that changed there were the contestants. But on The Price Is Right, all the games change every day, and the contestants change, so there's tremendous variety. And I think that adds to the reason that it's stayed fresh all these years. Plus the fact that Barker is masterful at what he does. He's wonderful at getting things out of these people. He's the consummate emcee, and I've worked with all of 'em. He's absolutely terrific, and he's exactly like he looks on television. He's the same person that he is on camera, which is not true of many people in this business, as you know. O: Is he a nice guy? RR: Sure, he's a nice guy. He loves dogs and cats; how could he be a bad guy? He's done more for animals than most people in the world. He puts his money where his mouth is, and he really is a terrific person. I'm really very fortunate to be associated with him. O: How did you get involved? I know that you replaced Johnny Olsen. RR: Yes, Johnny Olsen died. Johnny had been on the show for its first 14 years, and I was across the hall doing Press Your Luck, and I was also doing Love Connection. When Johnny died, they came to me, because that particular position on the show has several elements that are required: It requires you to do warm-up, it requires you to have a rapport with the emcee, it requires you to ad-lib without any notice, it requires you to be able to pronounce names and billboard the items. It requires a lot of things. And there are not too many people in the announcement business out here for game shows. So the pool is rather small, and I came closest to what Johnny was doing. So that's how I ended up with it. And I got along with Bob, which is important because it's Bob's show, and Bob had to get along with whoever was going to do it. RR: Not at all. Everybody loved Johnny, and was very saddened when he died, including me. We were friends. But the show had such momentum that everybody wanted to continue with it. And I was able to just step in and do the role. And everybody helped me. It was formidable, I'll tell you that, because it's not like any show I've ever done. And the American public really accepted me, which is wonderful. And it's even more wonderful now, because 11 years later, wherever you go, they know me. And it's nice to run into people in all parts of the world: I travel extensively outside the country and meet a lot of people in foreign countries who watch the show. Our particular version is on in the United States, Canada, Mexico, the Caribbean, Korea and the Philippines, and is on satellite in many other places. And then we have a native-language version that we franchise in Europe: It's in Spain, France, Germany, the Netherlands, England and a couple of other places. I forget. We're also in Australia. People know The Price Is Right. O: So some of those places dub the show in their own language? RR: No, they don't dub it. They have their own native-language version with their own people. It's hard to recognize it, even though we give them all the plans and they come over here and study with us. They go back and put their own twist on it, and it's always interesting to see it in a foreign country. I do a lot of travel in the Orient because I get my wardrobe over there, and it's fascinating the number of people you run into who know the show. O: That's where you get your wardrobe? RR: I get the wardrobe in Bangkok. When I started out, I did mostly Thai silk for many years, and I still do a lot of Thai silk because it's very colorful. When I joined the show, Bob was one of the most dapper dressers on television. And to be on stage with him, you have to do something equal or different. Equal you can forget, because they don't make fat men's clothes like that. So I started out with pastel jackets from Hong Kong, and [Bob] said, "Gee, that's nice. Why don't you do some more of those?" So I did, and now I'm in sequins and feathers. O: You know, there's a lot of political pressure in Thailand as far as abuses of children are concerned. Have you heard about that? O: Well, the Rod Roddy character on the show is just that, isn't it? A character? RR: Well, it's really me. I'm fortunate in that I get to play myself; the role I'm playing is Bob's companion on the show—to facilitate what he's doing with the contestants—but pretty much what I'm playing is myself. Within the constraints of the format of the show, of course. But I'm lucky that I am playing myself, because most people on television, you only know their characters. You don't know them. O: So are you actually excited when you get to give somebody a new car? RR: Absolutely. I love it. It's not my money. [Laughs.] I like to see people happy. We really do want people to win on the show, because that's why people watch. The worst thing that can happen on our show is not to have a winner. It's the pits. We love to give stuff away. O: Well, that Three Strikes game stinks. Nobody ever wins that. RR: Oh yes, they do. Oh yes, they do. And it's really exciting when they do. Many times it gets down to a 50/50 chance on that last draw, and it's really a thrilling game. You have to have something that's challenging, and that makes it exciting. You look at the odds on this show, it's a lot better than the lottery. We have 320 people in each audience, and out of those 320, nine get called. So you have a pretty good chance of winning some very nice prizes. Every game show you look at, the prizes are nothing compared to what we give away. We have a huge prize budget; over the years, we've given away over $150 million worth of stuff. I guess that's why people like it. Where else can you walk in off the street and go home in a new car? Now, people just don't walk in off the street—they're there in lines for a long time. But it's an event. And we really have a good time doing it. If Bob didn't have a good time doing it, we wouldn't still be doing it. He sure doesn't have to. He enjoys it. I enjoy it. We all enjoy it. We go to work three days a week—Monday, Tuesday and Wednesday—and then we come back the next week, and then we're off for 10 days. And I get a chance to travel and see some of these people around the country. And the real joy of doing this show for me is the fact that you get to go places, and people know you. It's like you've been there before. I can't think of a better job. I used to be a talk-show host, and it was nasty. It was one of the first nasty talk shows. And they were shooting at me in Texas. The original talk show I did was the one they patterned Eric Bogosian's movie after, called Talk Radio. The script was written as a result of the show I was doing in Dallas. And it was a high-charged show; you'd be fighting with people on the air all the time. And this is much better. O: So, you were a Morton Downey, Jr. type? RR: Well, I wasn't that nasty. But I was a really controversial figure at that time, because that was some time ago—long before all that stuff became popular. This is much nicer, trust me. O: How did you feel about The New Price Is Right, the prime-time knock-off that came out a few years ago? RR: Well, I didn't want to participate in that, because Bob wasn't in it, and our models weren't in it, and they made a lot of changes that I didn't think were appropriate. And I really didn't want to participate in it—they asked me to participate in it, and I declined. I'm glad I did, because it didn't do too well. And the reason, I think, that it didn't do well is that people know this show. It is what it is, and if you're going to play the Range Game, they know how the Range Game is played. If you're going to play Plinko, they know how Plinko is played. You can listen to this show while you're getting ready to go to work, and you know what's going to happen. And all of a sudden, if they change the rules of the game—which they did on the nighttime show—people resist that. And they changed the set, they changed the music, and they changed everything about it, so it really wasn't The Price Is Right. And people responded the way I thought they would; they didn't accept it. So I was glad not to be a part of it. And I don't think it helped us any, because a lot of people probably thought, "Oh, they've canceled The Price Is Right." We heard that for a long time, because of the way it was promoted. O: So was there resentment? RR: No, there was no resentment. I just thought it was an exercise in futility. If Bob had chosen to do the show, it would have been successful. It would have worked at night, but it would have had to be the right show. RR: Well, Doug is a nice guy, but he's not a game-show host. I've done some hosting; I did a game show in Branson for a couple years, and I can tell you that it's a tough gig. People look at it and say, "Oh, he's just a game-show host," but believe me, it's not an easy gig. There are a lot of things going on there that people don't think about. O: Is Doug Davidson back on The Young & The Restless? RR: Oh, sure. He's a big star on The Young & The Restless. He's a very nice guy, by the way. And he's an excellent actor. O: Do you have a camaraderie with the Y&R folks? I know you've had them on. RR: Well, we see them in the hall, but the truth is, I'm on the stage all the time, working all the time, and they're working, and we don't really get a chance to hang out. They're certainly nice people. They work a real hard schedule, you know. They put out an hour of drama every day, and that's really tough. O: So, you mentioned that you do the warm-up. RR: Well, yeah, you have to enfranchise people, because many people who come to our show have never been here before, and a lot of them have never been in a television studio, so they don't know what to expect. In about seven minutes, I have to tell them what to expect, what we're going to be doing, how it all works—and at the same time get the energy level up, although that's not really much of a job with this show. O: So it's explaining the rules and stuff, and not just, "How many of you want to win a new car?!" RR: Well, they're already just sitting there cheering. They cheer when they get in the studio, because they've been waiting for hours. A lot of people start lining up at midnight, and sometimes by 6 a.m., the whole show is filled. We don't tape until 1 o'clock in the afternoon. We have two shows, and occasionally, by 8 a.m., both shows are filled. A lot of people want to be on. It's just a small investment of time, and it's a fun thing to do. For people who come to Southern California who've never been here before, this and Universal Studios and Disneyland are the three biggest things out here. That's what they want to do, because they grew up with it. O: Tell me a little bit about your life outside The Price Is Right. RR: Well, I travel, at this point in my life. I travel as much as I can—go places, do things, meet as many people as I can. I enjoy myself. I've had a good time these last 11 years on the show, not that I didn't before. But it's much better now, and I have time to do things. I was a disc jockey, I was a radio executive, I was a program director, I was a talk-show host on the radio. I spent most of my years in radio, and then I got into the voice-over business. I did commercials. Soap was my first big television break; I was the voice of Soap. "Confused? You won't be after this episode of Soap!" So that was my big break into television. And it sort of took me from the commercial business, which was all voice-overs, into the production business, which is sitcoms and whatever. And as a result of Soap, I got into the game-show business. It was a very strange evolution, but that's what I did. And I still do commercials, but this show has allowed me to travel and do the things I like to do. When you're doing nothing but voice-over, you're strapped to a beeper and you don't want to leave. Because the talent pool is so competitive out here that if you miss one or two, they don't call you for a while. This show has allowed me to do what I want to do. O: You don't have any kids? RR: No, fortunately. Because then I'd be strapped down. [Laughs.] I'm free to travel, which is great. O: What do people always ask you when they come up to you? RR: "Where's your coat?" "What's Bob Barker really like?" "How do I get on?" And the answer to that is simple. Send $25 to me, that's Rod Roddy… [Laughs.] Those are generally the questions that you get. They want to know what Bob's really like, or what the girls are really like—and they're really terrific. Everybody gets along. It's a fun set. O: But I think a lot of people have a certain perception of show. They've heard the rumors about Bob Barker's sexual harassment suit, and have a perception that there's a lot of backstage scandal. RR: I don't think so. Not backstage—I don't see any scandal. I didn't see any scandal back then. I really didn't. All these players were friends of mine, and I certainly didn't see anything happening. People have disagreements, but show me a personal relationship where there aren't disagreements. Some of them turn into lawsuits like that one did, but it went away. I try to stay away from people's personal lives on the show; we get along professionally and we do the show together—and we have a good time together—but if you ask me what they do personally, I couldn't tell you because I don't know. We don't do dinner together, except on special occasions, and they do what they're doing, and I do what I'm doing. It works out real well that way. O: Is Rod Roddy your real name? RR: It's actually Robert Ray Roddy. I tried several names, because early on I was a disc jockey, and Robert Ray didn't make it. Robert Roddy didn't make it. Rob Roddy didn't make it. Bob Roddy didn't make it. My grandfather's nickname was Rod Roddy, and I decided to try that and it stuck. I started using it when I was a disc jockey. O: What kind of talk show did you do? RR: Well, the controversial one was a telephone radio talk show called Hotline in Dallas. O: What kind of controversy did you cook up? RR: Well, there was the Ku Klux Klan… I was always taking a liberal position in a very conservative town. You can get a lot of people excited with those positions. Even now, I always take a very liberal view of most every item that comes along. It was a very fiery show: The Ku Klux Klan was a constant threat, and I had several people who were regular enemies on the show. It was a major show. It really did very well ratings-wise. The truth of the matter is that I was very happy to get away from that, because once you have vented your spleen on every issue that you ever wanted to vent your spleen on, and taken sides on many issues you never even cared about, it gets old. And as a talk-show host, coming up with all these issues was very hard. I'm glad I don't do it anymore, and I really don't want to do it anymore. But never say never. You never know. "Oh, he's fun. He's a lot of fun. He fit in from the moment he… Well, even during the audition, he fit in immediately. Some of the best announcers in Hollywood wanted that job, and we auditioned them—we had them work on the show for a week, and the moment we had Rod on the show, I said, "This is the guy." His sense of humor, and his interplay with me when I talk with him, and his little bits in the showcases: All of it just went well, and is still going well, and he's developed a loyal following of his own, too. He's a nice guy."